Agritech has created a new series of tanks for liquids which can contain chemicals, food stuffs and industrial products, all of them in the liquid or semiliquid form.Agritech, can use these tanks also for chemical solutions and acids thanks to a special treatment. Every container is built with a very high technical fiberglass standard by using the best raw materials so that each tank is able to stock different products. Agritech is pleased to present its new slurry trays for farrowing crates mod. Agribac. Being made in reinforced and gelcoated fibreglass, they are light and extremely durable. Easy to install and to clean, the slurry tray Agritech are made to resist aggressive liquids. For large demands, Agritech can design and supply slurry trays with shapes and dimensions tailored to customers' requirements. Agritech introduce AGRICOOL 120, the best and most sanitary solution for deadstock like chicken, piglets, labs and rabbits. Very easy to use and to wash with high pressure water, it helps modern farmers to avoid the propagation of diseases and infections. The corpses can be stored for 15 days, thus delaying the collecting from the local sanitary authority. Agritech is proud to present a new range of axial fans specially designed to meet the need of modern farming. 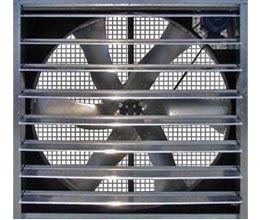 Our fans are manufactured in solid deep hot galvanised steel with blades in corrosion-free aluminium. Different sizes and options are available. They can be delivered both in assembled and unassembled form. • the accident and disease prevention of the attached operators. Our solar panel installations are projected to produce electrical energy from a minimum of 3 kWp to a maximum of 600 kWp. The solar panels of Agritech are constructed in a modular shape, and the main versions are 10, 20, 50 and 100 kWp. Solar panels represent a source of green energy by which the emission of polluting agents and greenhouse effect gases in the atmosphere is reduced to 0. Agritech is in a position to assist the customer in filling in the application forms for the obtaining of EU or governmental subsidies. These subsidies allow the refund of the invested capital in 9 to 10 years. The silos in this version are suitable for the storage of any kind dry bulk product having a maximum density of 1,5 to/ m3. The fiberglass main body grants for a long life, high resistance to environmental extremes and a high degree of thermal insulation. Silos mod. AGRISTRONG are assembled on heavy-duty support frames in deep hot galvanized steel and allow an easy discharge of the stored products into trailers, by means of manual or electro-pneumatic sliding gates. They are supplied complete with pneumatic filling tubes in stainless steel AISI 304 and breathing tubes made in high-tenacity polyethylene. Upon request, and in alternative to the gravity discharge, the AGRISTRONG silos can be provided with special extraction augers in deep hot galvanized or stainless steel. A large range of accessories, like capacity sensors and safety valves are available as options. Silos CUBO can be easily loaded on standard lorries by means of elevators or cranes. A lorry with 6,5 m loading surface will carry 12 silos filled up with bulk product. 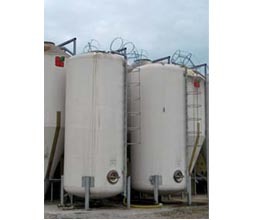 CUBO silos are also transportable in large quantities in dismantled form.